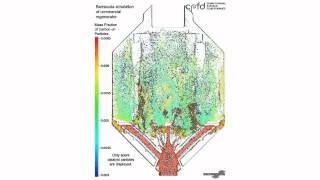 CPFD Software has entered into a collaborative agreement with the Institute of Process Engineering (IPE) of the Chinese Academy of Sciences (CAS) for the purposes of improving physics- and math-based particle drag models for use with the Barracuda Virtual Reactor®. 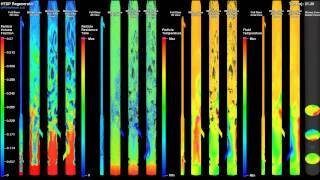 IPE, already a licensee of Barracuda®, has been at the forefront of research into non-homogeneous drag models based on the Energy-Minimization MultiScale (EMMS) approach. Multiple drag models have been published based on an EMMS philosophy which incorporates the critical effects of mesoscale on drag coefficients. One such model, based on the work of Yang et. al., is already incorporated within the Barracuda 16-Series product. Sample results showing an FCC riser calculated using EMMS drag is shown at right. 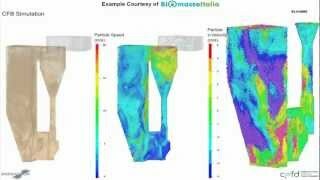 Both CPFD Software and IPE are working toward the creation of new drag models based on the EMMS principle. All drag models created as part of this effort will be available for use within the Barracuda Virtual Reactor. 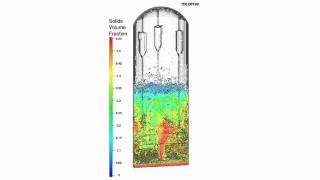 "A basic understanding of fluid-particle drag has been around for a long time," according to Peter Blaser, Vice President of Engineering for CPFD Software. "The drag of a sphere in an infinite, creeping flow is well known. However, when one studies drag for real particles in real conditions, the situation becomes less clear. Most drag models are empirically obtained. Further, they often assume two things, namely that particles are uniformly spaced within a computational cell and that every particle in that cell sees the same fluid velocity. This simply isn't the case. EMMS-based models are one way to include this sub-grid effects on fluid-particle drag, and we are pleased to be working directly IPE toward this end." 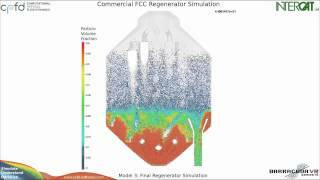 The Barracuda Virtual Reactor is a natural choice of CFD tool for development and incorporation of new drag models. Since the particle field is discrete, many sub-grid effects are already captured by the unique CPFD numerical method. Extending the sub-grid capabilities further to include non-homogeneous drag models is a natural next step for Virtual Reactor™ technology, and this fundamental R&D effort is a necessary prerequisite.